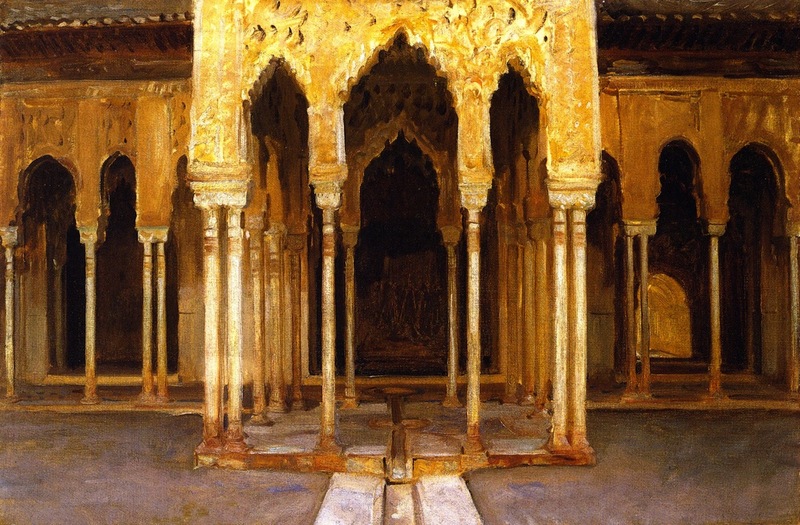 Alhambra, Patio de los Leones, 1895, oil on canvas by American artist John Singer Sargent (1856–1925). Image courtesy of The Athenaeum. The Alhambra complex in Granada, a province of southern Spain, has been a popular tourist destination for nearly two centuries. Named for the color of its walls (Calat Al-Hambra is a transliteration from the Arabic for “the red castle”), its three sections served as the home base for Muslim rulers on the Iberian peninsula for two centuries, until the last Islamic kingdom of Spain was dissolved after the Battle of Granada in 1492. For several decades after the reign of Ferdinand and Isabella, various Catholic monarchs used the site as an administrative center, and Charles V built a palace within its confines during the 1520s. But the site then suffered through several centuries’ worth of neglect. In 1829 Washington Irving, whose international celebrity was already unprecedented for an American author, stayed in the Alhambra during the late spring and early summer. “It absolutely appears to me like a dream; or as if I am spell bound in some fairy palace,” he wrote to a friend. Three years later he finished writing The Alhambra, a work that included a brief history of the Moorish kingdom of Granada, descriptions of Irving’s own travels, profiles of the offbeat inhabitants he met during his stay, and his own adaptations of the palace’s legends and myths—many of which resemble stories from the “Arabian Nights,” complete with mysterious caverns, imprisoned princesses, and hidden treasure. John Murray, the publisher of several of Irving’s previous books, was still smarting from the expense and relatively low sales of his Chronicle of the Conquest of Granada (1829), and he balked at this latest collection of Spanish-themed material. Irving soon found new publishers for the collection in London and Philadelphia—and it proved to be not only an immediate success but also one of Irving’s most enduring works. The book’s popularity played no small role in the renewal of European and American interest in the Alhambra during the nineteenth century. St. John’s Eve (June 23), occurred during Irving’s residence at the Alhambra, and the holiday must have made quite an impression since it features prominently in the narrative and a couple of the tales. During the feast, “the lower classes of Granada swarm into the country, dance away the afternoon, and pass midsummer’s night on the banks of the Darro and the Xenil,” while some residents “light bonfires on the hills.” In the opening scene of “The Legend of the Two Discreet Statues,” in the midst of this revelry, a young girl finds an ancient talisman and launches her family on a series of magical adventures. Notes: Constructed during the early decades of the fourteenth century, the Generalife is the section of the Alhambra containing a palace and gardens for the rulers of Granada. Originally, a covered walkway linked the Generalife across a ravine to the rest of the complex. Boabdil el Chico (or Abu Abdullah the Little) was the Spanish name for Abu Abdullah Muhammad XII, the last ruler of Muslim Granada. The bells rung for animas (page 1006) occur at dusk; the term derives from the Spanish word for souls. A somerset (page 1007) is the word we now spell as somersault. There lived once in a waste apartment of the Alhambra, a merry little fellow named Lope Sanchez, who worked in the gardens, and was as brisk and blithe as a grasshopper, singing all day long. . . . . If you don't see the full story below, click here (PDF) or click here (Google Docs) to read it—free! The story has the allure of Arabian Nights with the description of strange caverns,mysterious princesses and hidden treasures.What more,Sanchica'midnight adventures reminds one of the Alice's adventures in Wonderland.